Have you ever tried to take a picture of yourself with your phone, only to discover that you cut half your face out of the photo? It can be awkward to try to hold your arm out in front of you, aim the camera, and snap the photo. ArmsLength solves this problem using face detection, and a voice that gives you feedback until you line the shot up just right. 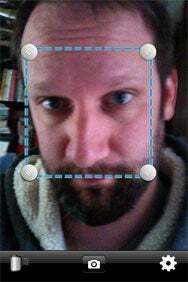 Best Face Forward: An outlined box helps ArmsLength use face detection technology to make sure your face is exactly where you want it when taking self-portraits with the iPhone’s camera. Developer Jeffrey Lynch makes ArmsLength very easy to use. When the app is launched, you’re presented with a live camera view, very similar to the iPhone’s native camera app. ArmsLength simply adds an adjustable, outlined box over the live image, within which the face-detection will occur. The charm of ArmsLength is when it’s actually put to use. Once you have chosen the spot that you want your face to appear, you hit the shutter release button and then hold the phone at “arm’s length” in front of you. The app will begin to give you audio feedback (“Left, Left, Up, Up, Good, Cheese!”) until you have the shot lined up. I found that as you make the face-detection box smaller, the app may lose a bit of accuracy as to where your image is positioned in the frame, but overall the results are very good. ArmsLength has a settings button on the main screen that lets you choose from a few basic options: auto-saving the image, vibrating when the image is “good” or has been saved, and choosing one of the three voices that give instructions. There appeared to be a bug with one of the voices (“Shouty”) where, if selected, nothing would happen, and the photo would not be taken, so be aware. Face-detecting apps can be very useful, and a lot of fun—especially if you take a lot of photos of yourself. There are a few areas that could be improved in ArmsLength, but overall the app works very well and can really help you get the shot you want.